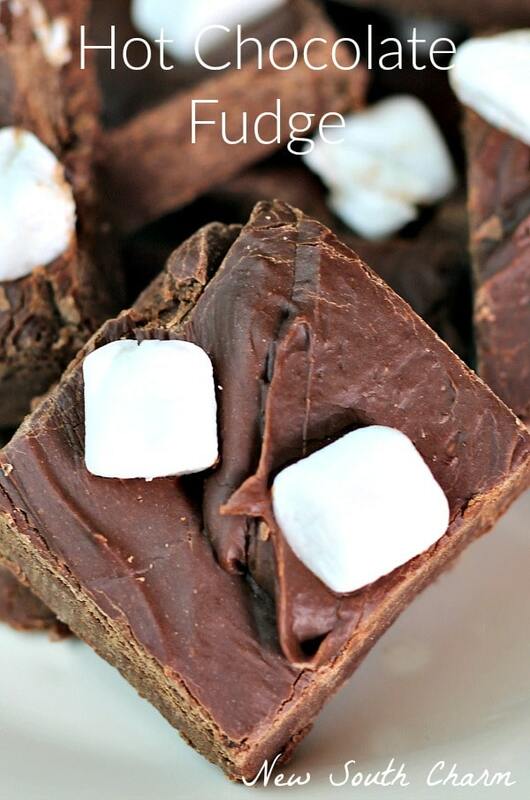 Fudge is one of my favorite Christmas treats. Hot Chocolate Fudge is made with only three ingredients in just minutes. I love Christmas for a lot of different reasons but of course one of them is the food. Really though isn’t the food one of everyone’s favorite things this time of year? This fudge has a touch of hot chocolate flavor and it makes it all the more Christmasy (is that a word?) perfect for enjoying this time of year. For a fun festive touch top it off with mini marshmallows. I know a lot of people think that making candy is hard. I did for a long time but it turns out it’s not complicated at all. Once you’ve learned to make fudge with this easy method you be making it all the time not just at Christmas. Begin by combining one packet of instant hot chocolate with a can of sweet condensed milk in a bowl stirring until powered is completely dissolved. Next, add two cups of semi-sweet chocolate chips to mixture. Give it a quick stir then pop it in the microwave in sixty-second intervals stirring in between until chips are completely melted. 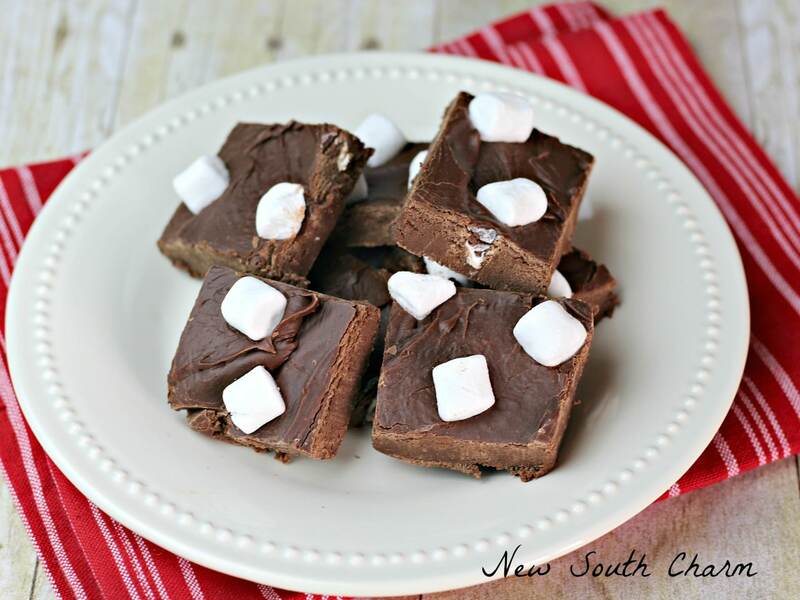 Pour the chocolate in to a foil lined 9×9 pan. Gently press marshmallows into the chocolate. I didn’t use the whole cup but you can if you choose. Then place in the refrigerator for two hours or until it is firm. Cut into squares and enjoy. Store in an air tight container to help prevent the fudge from becoming dry. Cut into squares and enjoy. 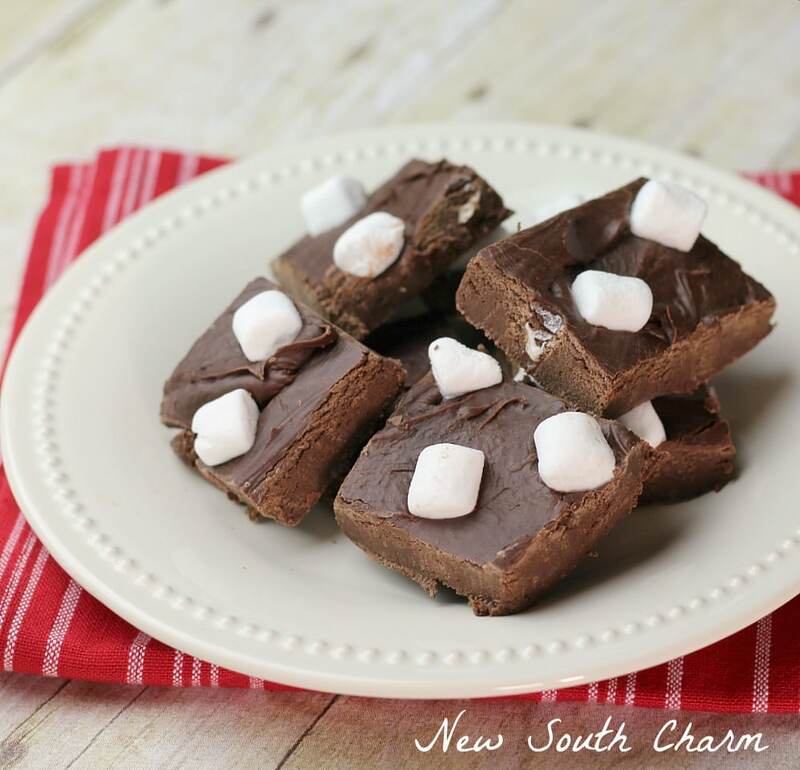 Not only is this fudge perfect for snacking while wrapping presents it makes a great gift for neighbors or friends. Combine one packet of instant hot chocolate with a can of sweet condensed milk in a bowl stirring until powered is completely dissolved. Pour the chocolate in to a foil lined 9x9 pan. Gently press marshmallows into the chocolate. I didn’t use the whole cup but you can if you choose. Store in an air tight container to help prevent the fudge from becoming dry. 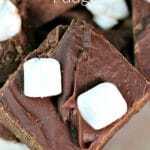 I just pinned your awesome Fudge, please save me a piece! Hope you have a very special week and thanks so much for sharing with us at Full Plate Thursday.